In October 2013, I purchased a pair of photographs on eBay which appear to illustrate an early episode in the history of neutral buoyancy by water immersion: Figure 1, labeled 69442B, and Figure 2, labeled 69471B. They were listed on eBay under the title, “2 ASTRONAUT [sic] UNDER WATER GENERAL DYNAMICS (181234004788#).” The eBay seller provided no provenance or additional information. All I know is what was stamped and written on the backs of the photographs: the photo numbers and the notations “unclassified,” “General Dynamics,” and “Convair Division.” Since then, I have been trying to uncover the story behind these pictures. Figure 1. General Dynamics, Convair Division, photo 69442B. Figure 2. General Dynamics, Convair Division, photo 69471B. Nowadays everyone knows that astronauts train underwater for their spacewalks, or extravehicular activities (EVA). It was even featured prominently in the movie “Armageddon” (IMDb, 1998), probably the closest thing to “correct” in the whole movie. The Convair Division of General Dynamics was in San Diego, California. A quick query to Francis French at the San Diego Air & Space Museum, repository for many of the company’s documents and records, did not yield any insights. It became clear that if I was to learn more about this particular activity, it would come from an analysis of the photos themselves. I already knew that GD was an early developer of neutral buoyancy techniques using water immersion for astronaut training and procedures development (Mattingly and Charles, 2013). The company was certainly no stranger to neutral buoyancy, but at a different scale than a single astronaut: it has been building submarines for the U.S. Navy since 1900 (General Dynamics, 1998). GD came close to becoming the first contractor to provide such training to NASA’s Gemini astronauts. In July 1966, NASA astronaut Scott Carpenter visited GD’s underwater facility in San Diego and was impressed with their capabilities. He was familiar with Convair from previous visits, starting in 1959 to monitor the development and construction of the Atlas rockets which boosted the Mercury capsules into low Earth orbit (Voas, 1960). Carpenter was on his way back to Houston intending to recommend that the company train the Gemini astronauts. But he was diverted to Baltimore, Maryland, apparently with no more information than to visit a group of contractors at the McDonogh School in nearby Owings Mills. He arrived unannounced at the school’s pool where he witnessed the neutral buoyancy capabilities developed by Environmental Research Associates (ERA). What he saw at McDonogh changed his mind, and soon thereafter Gemini astronauts arrived at the McDonogh School for EVA training (Mattingly and Charles, 2013). I don’t know what he had seen in San Diego, but whatever it was is important for an understanding of NASA’s decision to go with ERA. Persons. There was one central person in both images. Figure 2 also included a second person, probably a safety diver or in-water observer: note the second person’s right hand and forearm in a wetsuit visible behind the central person’s right elbow, and his right leg visible through the circular opening to the left of the central person’s right leg. 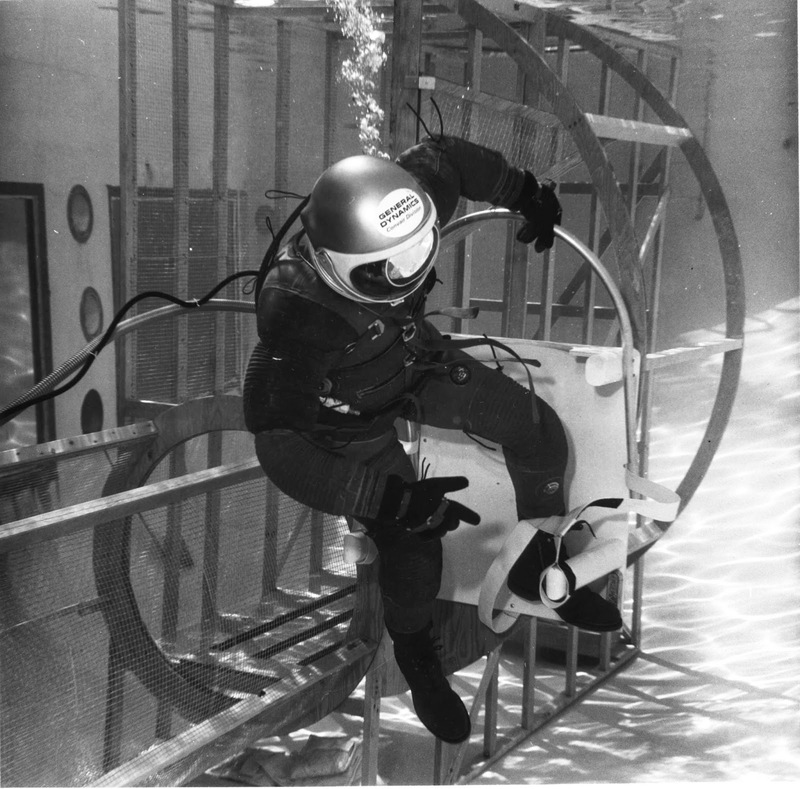 Life support for the central figure appears to have been provided by a large diameter pressurized hose extending horizontally underwater to the central person from out of frame at the left. It seems to have connected to the upper back of the test subject, between the helmet and the middle of his back. A thinner black cable, possibly a telephone line, was bundled with the pressure hose. 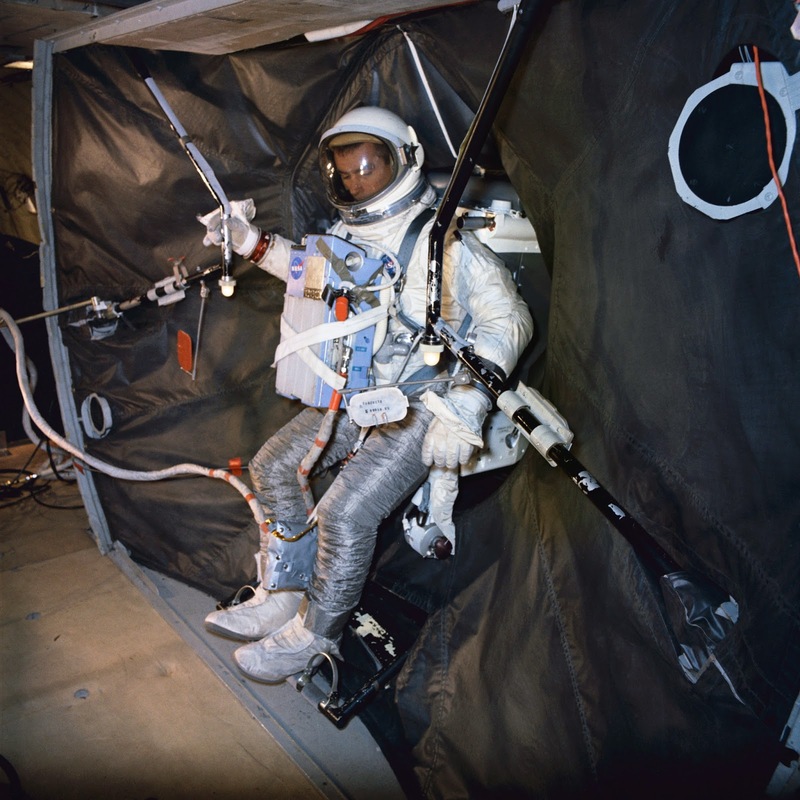 In Figure 2, the pressurized hose was secured to the test fixture, possibly to provide stress relief and facilitate mobility by the test subject. The central person was also wearing what appears to be a white mockup of a Garrett AiResearch EVA Life Support System (ELSS) (Figure 4) on his chest in Figure 2 only. This identification is based on the location and size of the unit, and its distinctive top panel (Thomas and McMann, 2006, pp. 66-7). Tools. 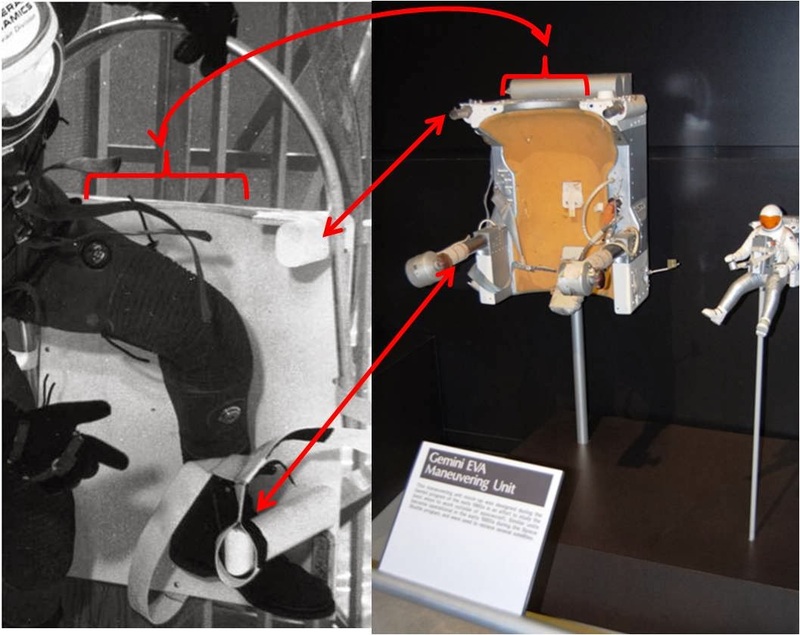 In both pictures, the central person appeared to have his left leg inside a loose strap attached to what might have been a simplified wooden mockup of the Astronaut Maneuvering Unit (AMU) (Figure 4). The AMU was developed by the Ling-Temco-Vought Co. for the U.S. Air Force experiment D012 (Shayler, 2004, p. 57). Its tentative identification derives from features suggesting over-the-shoulder thruster assemblies and side-mounted hand controllers, and from the curved cut-out at its top to accommodate the wearer’s helmet, all present in the AMU (Figure 5). However, its front-to-back depth and the detail of the over-the-shoulder and side-mounted features merely suggest the structure of the corresponding features of the AMU; perhaps the GD mockup represented only the aspect of the AMU which would have interfaced with the astronaut’s suit and body. The visible straps around the subject’s left leg differ between the photographs: in Figure 1, there was a section of black fabric, presumably Velcro, while in Figure 2 the corresponding area appears white. Figure 5. General Dynamics’ possible mockup (left image) of LTV AMU (right image). Detail from Figure 1 shows mockup elements corresponding to features on AMU: semi-circular cut-out for wearer’s helmet (bracketed at top of both images); over-shoulder protuberances in mockup corresponding to reverse thrusters (middle two-headed arrow); lower protuberances on mockup correspond to hand-controller mounts on AMU (bottom two-headed arrow). Scale model at right illustrates astronaut position during AMU operations. (Photo credits: General Dynamics, ca. 1964, left image; John Charles at National Museum of U.S. Air Force, 2011, right image). 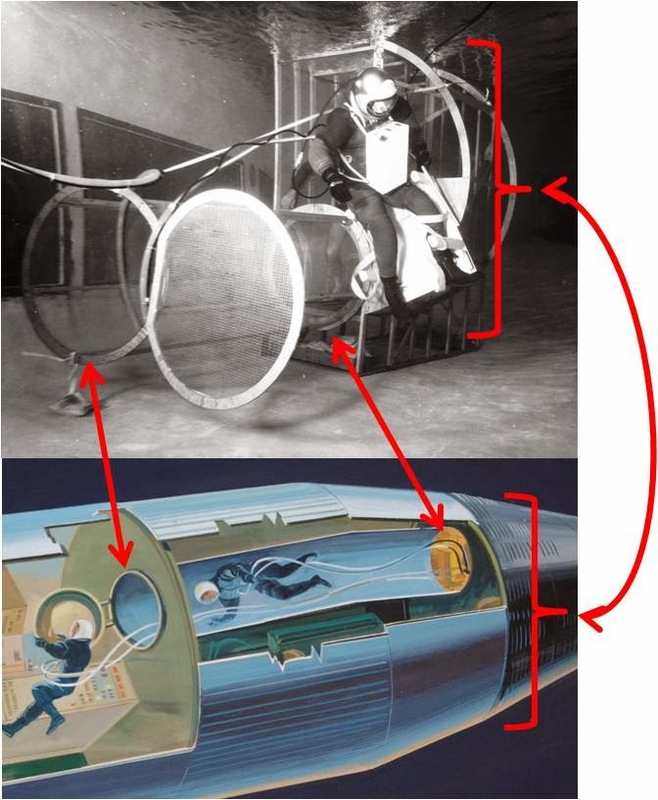 A thin curved pipe or tube, apparently metallic and connected to the top of the AMU mockup (seen more clearly in Figure 1), was used by the central person as a hand-hold, but was not present on the LTV AMU. The presumed AMU is seen in both photographs to be in proximity to the large test fixture, orthogonally aligned in Figure 1 but slightly askew in Figure 2, indicating that may have been loosely affixed to the test fixture. Activities. In Figure 2, the central person’s umbilical appeared to originate out of frame to the left, and was routed through the open top side of the cylindrical structure, or tunnel, before exiting through the open end of the tunnel and then connecting to the figure. Apparently the central person had translated out of the tunnel through its open end before arriving at his work site, suggesting egress from an airlock for the EVA. The central person interacted with the faux AMU in an unlikely manner. His left leg, but not his right leg, was behind a loose strap attached to the AMU. This is true in both photographs, suggesting it was a common practice and therefore intentional. However, it is not consistent with astronaut interaction with the AMU in other testing or spaceflight settings. There is no sign of any mobility aids or restraints as were provided for in-flight AMU activities (see Figure 6). In fact, there are no hand holds or mobility aids visible anywhere on structure. Test fixture. The dominant feature of both photographs was a wooden framework about 10 feet (3.0 meters) tall, about 6 feet (1.8 meters) wide at its widest point, and about 12 feet (3.7 meters) in length. It was apparently painted, and what would have been contiguous surfaces were substituted by a metal mesh. The largest portion was laterally dissimilar: a large half-cylinder was mated to a rectangular structure. There was a triangular brace in the top half of main cylinder. The smaller portion was the tubular tunnel, about 3 feet (1 meter) diameter and 8 feet (2.4 meters) long, attached to the lower center of main section. A wire mesh disc at the unattached end of the tunnel may have simulated a hatch cover, shown swung open toward the right (Figure 2). Both the hatch end of the tunnel and the larger section appeared to be weighted down by ballast in fabric bags about 6 inches across. Given the aerospace nature of work done by GD and the astronautical appearance of the central person, the test fixture may have been a representation of a then-current spacecraft design. The pairing of a tunnel and a large broad-faced bulkhead suggest either the Gemini-B/Manned Orbiting Laboratory (MOL) program of the Air Force or NASA’s Apollo Lunar Module (LM) docked to its Command Module. The Gemini-B/MOL interpretation is unlikely for several geometrical reasons: the tunnel appears straight, whereas the tunnel from the MOL to the Gemini-B heat shield was angled and bent; the tunnel terminated too close to the periphery of the presumed heat shield, and at its bottom instead of at its top; and the diameter of the large element appears greater than the Gemini heat shield diameter (Figure 7). Instead, the large element had some features which may correspond to the structure of the ascent stage and crew compartment of an early version of the LM (Figure 8). Of prime significance is a recessed triangular frame with a wire mesh interior, which appears to represent the forward facing window in the left half of the LM crew cabin. The triangular windows are unique to the LM, so their inclusion is strong evidence that this is a LM mockup. This is further supported by the combination of the rectangular central portion, from the bottom of which the tunnel exits, and the recessed rounded portion in the right half of the picture, which represented the left half of the cylindrical crew cabin. The round opening at the bottom of the rectangular section could have been the circular hatch once planned for the LM, which by 1964 was simply a vestige of its discarded role as a docking port (Aviation Week & Space Technology, 1964); by January 1965 it had been replaced by the familiar square hatch. Together they resemble most of the LM crew cabin structure, minus the corresponding rounded portion on the photo-left of the rectangular structure, which would have represented the right half of the cylindrical crew cabin. These features correspond to the stage of LM evolution represented by the TM-1 mockup, which was current between March 1964 and January 1965 (Godwin, 2007, pp. 72-3). The tubular tunnel terminating in the circular LM hatch might have simulated the tunnel of another spacecraft which would have been docked to the front port of the LM. However, there is no external structure around the tunnel, and as described above such a docking is inconsistent with the inferred stage of LM development. Therefore, the tunnel attached to it does not reflect a contemporary aspect of the Apollo LM or its counterpart the Command Module. Perhaps it represents an airlock attached to the front port of the LM (Figure 9). This might have been part of a proposal to use the LM in an Earth-orbiting research or operations role. Such an application is not shown among the options for LM-derived vehicles advertised by Grumman (Grumman Aircraft Engineering Corp., 1970), but it may have been considered briefly nonetheless. There was a proposal to use the LM for long-duration lunar surface habitation (NASA, 1967, p. 29) which incorporated an airlock to minimize the loss of cabin atmosphere during repeated EVAs (Figure 10). However, that was a 1967 concept for use in a gravitational environment (albeit 1/6-g), not a ca. 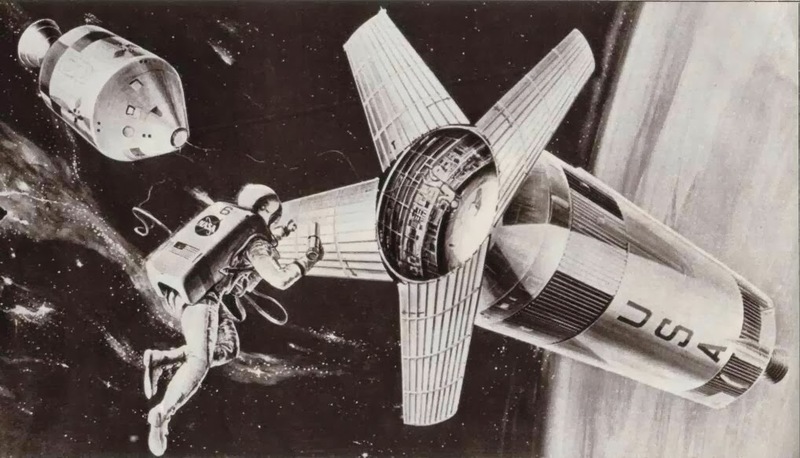 1964 concept for weightlessness, and that airlock was noticeably different from the structure in Figures 1 and 2. In light of this uncertainty, it is possible that the test fixture in Figures 1 and 2 may simply represent a generic LM-derived spacecraft concept for the neutral buoyancy activities being undertaken, and its specific features were not intended to correspond to actual or planned spacecraft. The test fixture was apparently repositioned in the interval between Figures 1 and 2. In Figure 1, the rectangular component appeared nearly aligned with the three vertical lights between two windows. In Figure 2, the rectangular component was more aligned with the middle of the observation window to the left of the three lights. The ballast bags appear not to have been rearranged, indicating that the fixture was moved but not emersed and resubmerged. Setting. Both photographs were made in the same facility, a water tank about 10 feet deep. If the large element of the test fixture represents the Lunar Module ascent stage (Grumman Aircraft Engineering Corp., 1964), then the depth of water required to submerge it completely (as demonstrated in Figure 2) was 9.4 feet (2.9 meters). The scenes in both images were well-lighted for photography purposes: from above water, perhaps using natural sunlight, suggested by the refraction patterns of surface ripples on the floor in Figure 1, and also apparently from a subsurface light source, out of frame left, judging from the shadows in Figure 2. The facility had at least three large distinctive observation windows and arrangements for subsurface lighting, suggesting a public facility for underwater shows or exhibitions. Thus, the setting was presumably an existing underwater exhibition facility in the San Diego area, in proximity to Convair. A Google search of public aquariums near San Diego produced two possible venues. The Aquarium of the Pacific in Long Beach, California, was established in 1998, according to the response to an email query, and was thus not a candidate. The Birch Aquarium at the Scripps Institute of Oceanography was opened in 1992, and was likewise not a candidate. However, it was preceded by the T. Wayland Vaughn Scripps Aquarium-Museum in La Jolla, California, which existed from 1951 to 1992. A photograph (Figure 11) from the 1967 annual report (Scripps Institute of Oceanography, 1967, p. 35) shows what may be an interior view of one of its distinctive windows; it appears similar to the windows in Figures 1 and 2. Thus the Vaughn Aquarium may have been the setting for the neutral buoyancy activities in the photographs. However, some questions remain to be answered, such as how a tank which was presumably a habitat for its marine occupants came to be emptied, cleaned and made available for GD’s use. Time. GD’s use of neutral buoyancy techniques was limited to the early to mid 1960s based on other evidence (Mattingly and Charles, 2013). 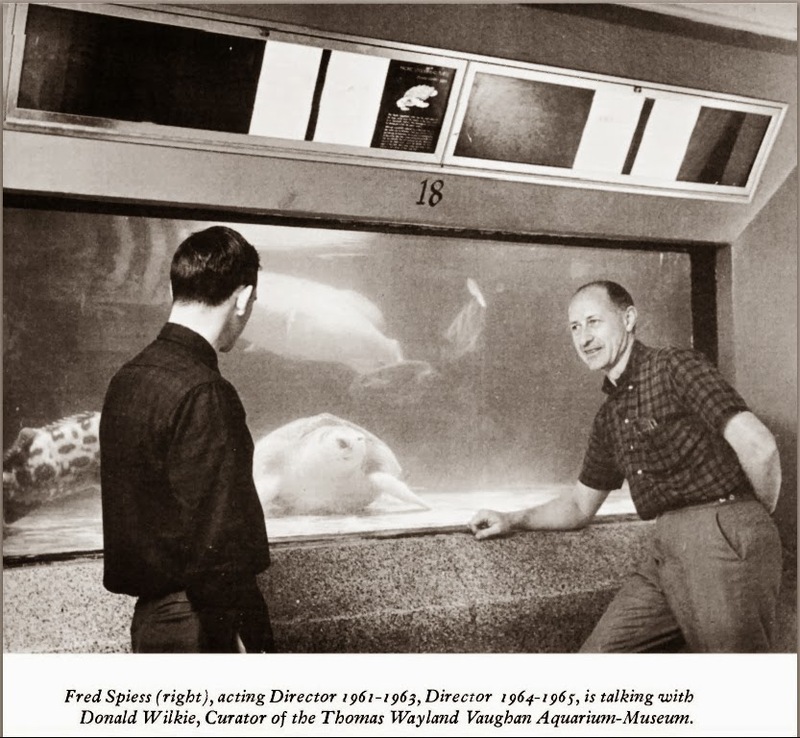 The Vaughn Aquarium was in existence from 1951 to 1992. The Mark IV-type full pressure suits were introduced into service by the U.S. Navy in the 1950s (Young, 2009, pp. 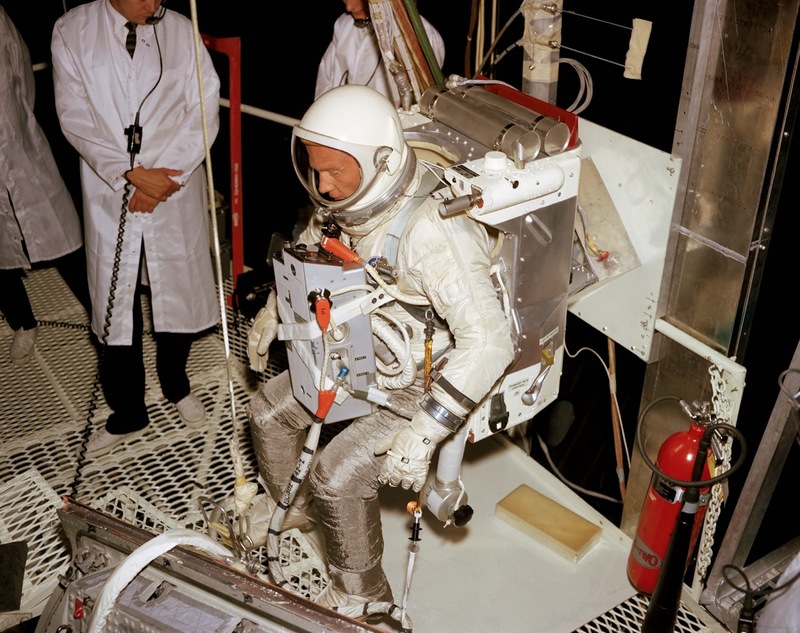 19, 22) and decommissioned suits were available for widespread ground testing by 1964 (Mattingly and Charles, 2013). The presence of the mockup ELSS in Figure 2 indicates a date between January 1964 when the ELSS design was finalized (Thomas and McMann, 2006 p. 66) and November 1966 when the end of the Gemini program also ended use of the ELSS and presumably its usefulness in neutral buoyancy simulations (a different system was already in development for the upcoming Apollo flights). The faux AMU placed the date between May 1964, when LTV won the contract to build three flight units for U.S. Air Force experiment D012 (Shayler, 2004, p. 57) and September 1966 (Hacker and Grimwood, 1977), when the AMU was definitively deleted from the Gemini flight program (although the Air Force remained interested in using it for some period of time thereafter (Wade, undated)). The LM configuration TM-1, with its round forward hatch, was current between March 1964 and January 1965 (Godwin, 2007, pp. 72-3). Thus I estimate the approximate calendar date for the two images as no earlier than May 1964, no later than September 1966, and probably not later than early 1965. Table 1. Similar and different elements of Figures 1 and 2. The available evidence indicates that the spacecraft and tool mockups in the photographs were likely used between mid-to-late 1964 and early 1965, although they might have continued to be used after those dates for general studies in neutral buoyancy. The similarities in arrangement of the central person, the test fixture, the background and the perspective of the photographs suggest that they were made within a single session, perhaps showing a sequence of activities. On closer inspection, it becomes apparent that there were differences in lighting, body-worn equipment, features of the tools, possibly the space suit and even the location of the test fixture (see Table 1). These differences indicate that they were made during separate sessions, perhaps even on different days. It is of interest that, despite their differences, the two images show the central person in nearly the same position and orientation with respect to the test fixture. He was above the top of the faux AMU, with his left leg inserted behind the same strap. This suggests that the action was intentional and significant. However, this does not represent an effective interface with the backpack-style AMU. Assuming a leg strap was part of the AMU restraint system, it should not have been necessary to enter it from the top of the unit. In addition, by early 1966, when Gemini astronauts were training to use the AMU in flight, there was a significant set of fixtures associated with donning it: handholds, footholds, straps and hoses (Figure 6). Despite those aids, Gemini 9 astronaut Eugene Cernan, the first person who attempted the task in spaceflight, abandoned the task it because the required physical effort overwhelmed his suit cooling system (Evans, 2013). Perhaps the simplistic approach to AMU donning shown in these images was an early stage in the progressive development of the more robust (but still inadequate) donning aids used on Gemini 9, but any role of GD in preparations for AMU flights, including donning studies, has yet to be uncovered. If, however, the tool I have identified as a faux AMU was not, in fact, a mock AMU, then this analysis is moot, and the device being simulated remains to be identified. Besides the faux AMU, there is the ambiguous test fixture and the mission it supported. 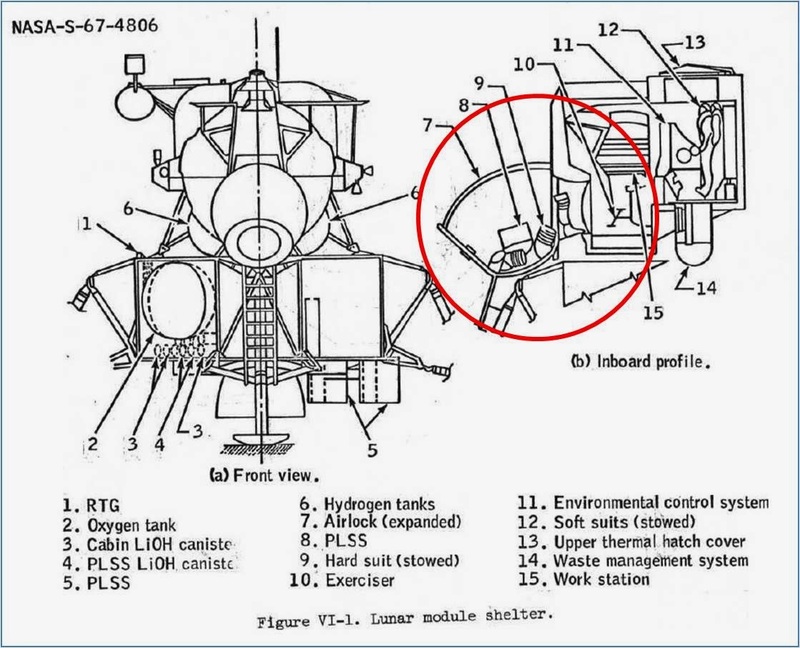 Its resemblance to an early design for the Grumman’s Lunar Module suggests that GD was evaluating extravehicular activities associated with the Apollo program or perhaps the follow-on Apollo Applications Program (AAP) (Wikipedia, 2014; Shayler, 2002), which would have utilized surplus Apollo vehicles for scientific missions in Earth orbit as well as on the Moon. Judging from the course of the life support umbilical, the test subject had translated from the open end of the tubular tunnel, presumably representing an airlock, to the faux AMU which was affixed to the lower left front panel of the LM mockup, below its left forward window. While the AMU or similar maneuvering units were considered for AAP use (Figure 12), I have not seen any plans to use them in conjunction with a LM-derived vehicle. What does all this mean? A great amount of detail can been inferred, but how close have my inferences come to the reality of GD’s role in spaceflight neutral buoyancy techniques? Were these photos really made in 1964? Where? What were the test fixtures intended to simulate? Does 69442B predate 69471B? Why was the scene duplicated so closely on a second occasion, and why were the obvious changes introduced? Why have no other photos surfaced? If in fact these images date from 1964, it was two years before Carpenter almost recommended GD for the NASA contract. During those two years they must have made as much progress as ERA. My colleagues Francis French and Alan Renga at the San Diego Air & Space Museum, continued searching their General Dynamics records and found a document dated July 1968 (Braxell and Thomson, 1968) which reported on a different type of underwater work by subjects wearing the Mark 4 suit as well as in a Gemini-type suit; however, it is silent on the neutral buoyancy work illustrated in Figures 1 and 2. I have taken my forensic analysis of these two photos as far as I can, without new information. Additional questions include: where are the photos and reports from 1965 and 1966 which document the capabilities that impressed Carpenter? Who funded that work? How much longer did they pursue neutral buoyancy work after it became obvious that NASA would not support it? Maybe I can learn more when I am in San Diego in May 2014 for the 85th Annual Scientific Meeting of the Aerospace Medical Association. I will visit the San Diego Air & Space Museum, and possibly the Scripps Institute of Oceanography. Perhaps some of the answers are awaiting me there. My thanks to Addie Eure, Marketing Coordinator, Birch Aquarium at Scripps, the anonymous Guest Support Specialist, Aquarium of the Pacific, and especially to Francis French and Alan Renga, San Diego Air & Space Museum. Aviation Week & Space Technology. 1964. Aviation Week & Space Technology. February 10, 1964. Braxell, R. R. and Thomson, W. G. July 1968. Selected Experiments in the Assembly of Structures in Space. Life Sciences Department, Convair Division. San Diego : General Dynamics, July 1968. Sponsored by Aero Propulsion Laboratories, Wright-Patterson Air Force Base, Ohio. Contract F33-615-67-C-1302, "Assembly and Maintenance of Lightweight Metallic Structures in Space". Cunningham, Walter. 1977. The All-American Boys. New York : Macmillan Publishing Co., Inc., 1977. ISBN 0-02-529240-4. Evans, Ben. 2013. Date With An Alligator: The Trials of Gemini-IXA. Space Safety Magazine. [Online] June 7, 2013. [Cited: Dec. 27, 2013.] http://www.spacesafetymagazine.com/2013/06/07/date-alligator-trials-gemini-ix-a/. General Dynamics. 1998. General Dynamics Electric Boat. [Online] 1998. [Cited: Jan. 1, 2014.] http://www.gdeb.com/about/history/. Godwin, Robert. 2007. The Lunar Exploration Scrapbook / A Pictorial History of Lunar Vehicles. Burlington : Apogee Books, 2007. 978-1-894959-69-8. Grumman Aircraft Engineering Corp. 1970. Apollo Program: Grumman's "Lunar Module Derivatives for Future Space Missions," Circa 1970... Heritage Auctions. [Online] 1970. [Cited: Jan. 19, 2014.] http://historical.ha.com/c/item.zx?saleNo=6075&lotIdNo=28003. Grumman Aircraft Engineering Corp. 1964. Inboard Profile of the Lunar Excursion Module, 1964. National Archives, Online Public Access (OPA). [Online] March 10, 1964. [Cited: December 4, 2013.] Entry 55, Box 3. Hacker, Barton C. and Grimwood, James M. 1977. On the Shoulders of Titans. Washington : National Aeronautics and Space Administration, 1977. p. 371. IMDb. 1998. Armageddon (1998) Trivia. [Online] 1998. [Cited: Jan. 24, 2014.] http://www.imdb.com/title/tt0120591/trivia. Mattingly, G. Sam and Charles, John B. 2013. 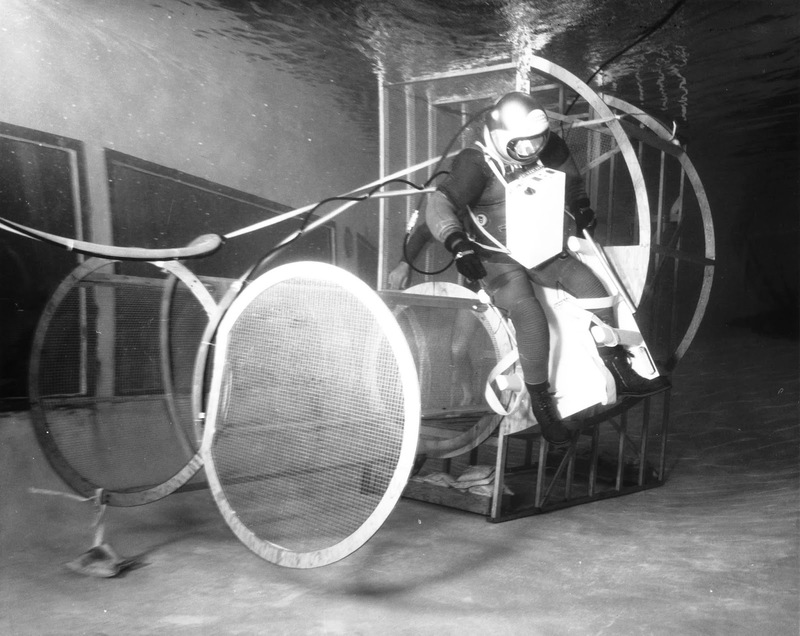 A personal history of underwater neutral buoyancy simulation. The Space Review. [Online] February 4, 2013. [Cited: December 4, 2013.] http://www.thespacereview.com/article/2231/1. NASA. 1967. Lunar Mission Planning Data Book. Lunar Missions Office, NASA Manned Spacecraft Center. Houston : NASA Manned Spacecraft Center, 1967. p. 142. Library, Center for Advanced Space Studies, Houston TX 77058. TL 789.8 .U6 M282 1967. NASA. 2008. NASA - T-38A Talon Performance and Specifications. Dryden Flight Research Center. [Online] Sep. 22, 2008. [Cited: Feb. 15, 2014.] http://www.nasa.gov/centers/dryden/aircraft/T-38/performance.html#.Uv9nEPldWSp. Scripps Institute of Oceanography. 1967. Annual Report for the Year Ending June 30, 1967. Scripps Institute of Oceanography. La Jolla, Calif. : s.n., 1967. p. 35. Shayler, David J. 2002. Apollo: The Lost and Forgotten Missions. 1st. Chichester : Springer, 2002. p. 344. ISBN 978-1-85233-575-5. Shayler, David J. 2004. Walking in Space. Chichester : Praxis Publishing Ltd., 2004. 1-85233-710-9. Thomas, Kenneth S. and McMann, Harold J. 2006. US Spacesuits. Chichester, UK : Praxis Publishing, Ltd., 2006. Voas, Robert B. 1960. Project Mercury Astronaut Training Program. NASA Space Task Group, Langley Field, Va. 1960. Wade, Mark. undated. 1966.11.18 - NASA plans to include the DOD's astronaut maneuvering unit "back pack" aboard AAP flights. Encyclopedia Astronautica. [Online] undated. [Cited: Dec. 16, 2013.] http://www.astronautix.com/details/nas22002.htm#chrono. Wikipedia. 2014. Apollo Applications Program. Wikipedia. [Online] Jan. 10, 2014. [Cited: Jan. 24, 2014.] http://en.wikipedia.org/wiki/Apollo_Applications_Program. Young, Amanda. 2009. Spacesuits / The Smithsonian National Air and Space Museum Collection. 1st. Brooklyn : powerHouse Books, 2009. 978-1-57687-498-1. If Carpenter was piloting a NASA T-38, this diversion was not trivial. Google Earth gives the straight-line distance from San Diego to Baltimore as about 2,300 miles. The T-38 is usually refueled every 700 miles (Cunningham, 1977 pp. 70-75), so a direct flight from San Diego to Baltimore would have needed three intermediate stops. A NASA website (NASA, 2008) gives the range of the T-38 as about 1,140 miles, although practical considerations such as weather and safety margins required more stops. Or, he might have flown commercial. Aquarium of the Pacific, 100 Aquarium Way, Long Beach, CA 90802, www.aquariumofthepacific.org; email response received 25 Oct. 2013. Birch Aquarium at Scripps, 2300 Expedition Way, Scripps Institute, La Jolla, San Diego, CA 92037, www.aquarium.ucsd.edu; email response received 2 Dec. 2013.